London: Baldwin & Cradock, 1834. Complete in 3 volumes. Books measure 8 3/4 x 5 3/4 inches. Collation, viii,534,,pp, ix,,616pp, viii,534,,pp, lacks half titles?. Volume 3 comprises Reports of Select Farms; Outlines of Flemish Husbandry; Useful and Ornamental Planting; Road-Making and Cottage Economy, etcetera.Bound in period half calf, calf corners, marble boards, coloured endpapers. Each volume professionally rebacked, retaining the original spines. Bindings rubbed on edges, occasional abrasion wear. All bindings in good clean firm condition. Internally, prevoius owners bookplate, bookplate gift/donation. Pages in very good clean condition. 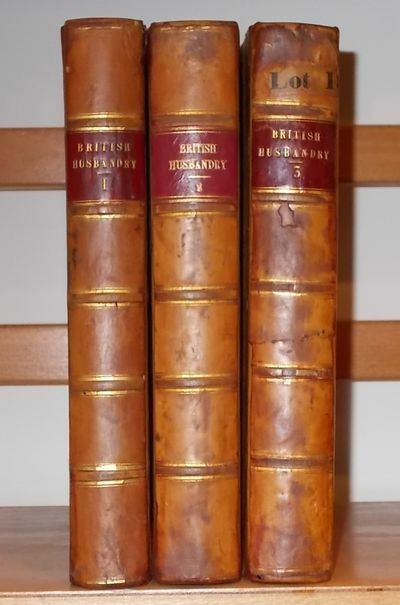 A very nice set, in period bindings. . First Edition. Period Half Calf . Very Good. 8vo.